Remember those moments at a social gathering, when someone pulls out the most awkward dance moves, but they move with such conviction you can’t help but name them as the life of the gathering? Throw that sentiment behind a party with the dial turned up to eleven and that is what you’ll be getting at a Confidence Man show. The night was full of eccentric costumes, blazing dance moves and stoic faces; full of self-assurance as the foursome in Confidence Man, joined by their opening DJ Lex Deluxe, who helped put on the ‘party of the year’ at 170 Russell. Lex Deluxe, a resident Sydney based DJ, started the pumping party off quickly displaying her smooth and cultivated DJing skills to everyone in the venue. Spending an hour and a half up on stage, Lex Deluxe built her performance around heavy beat-based tracks building into a fulfilling finish with ‘banger’ after ‘banger’ barraging the growing, energetic crowd. 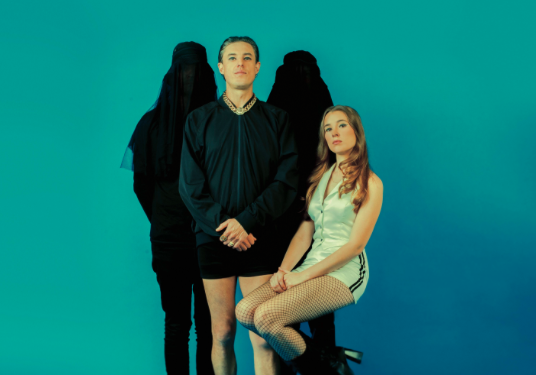 It was a perfectly ironic choice for Confidence Man to select 170 Russell as their venue for the performance, as the venue also doubled as a club throughout the week; a perfect setting for a dance party and for a band that is caught between dance and rock themselves. Arriving on stage to a loud applause were Confidence Man’s Clarence McGuffie and Reggie Goodchild. The two figures shrouded in mystery high fived before showboating their skills as a producer and drummer respectively throughout an elongated introduction for the opening track, 'Bubblegum'. Yet, the crowd rushed towards the front and were completely behind the antics of the two mystery men. The entrance of Janet Planet and the soon to be bare-chested Sugar Bones was extravagant, strutting out through the beat-laden intro in their first outfits of the night, both seemingly looking like they were ready to go to a rave. The cool crew led through 'Fascination', 'Better Sit Down Boy', 'Let Me Catch My Breath' before a favourite off of their debut album Confident Music For Confident People, 'C.O.O.L Party', which heated the crowd to a fever pitch. 'C.O.O.L Party' highlighted the mood in the venue, with the mostly spoken track melding with the beats of Clarence and Reggie to describe the fun had behind the ‘party of the year’, drawing similarities with the fun had by the revellers at 170 Russell on Sunday night. Confidence Man’s real talent lies in the ability to flow between so many different eras of dance music, and if it wasn’t clear through the musical tone shifts on Confident Music For Confident People, then it definitely was evident throughout their live performance. Using the intervals between the costume changes of Janet Planet and Sugar Bones, Clarence and Reggie experimented with dance tracks. The two back-men used these moments as an opportunity to show-off their musical talents, as visuals of the two shrouded individuals flashed chromatically and danced along with their beats. The duo moved through the sounds of classic nineties raves, with heavy beats and swelling synth effects, later opting for a slightly more vivid rendition of the 2000s dance inspired, instrumental track 'Sailboat Vacation'. The costume changes themselves were entirely reminiscent of Confidence Man’s seeming mantra, ‘showy, confident and fun’, with the main costume change involving a coned, light up bra and flashing shoulder pads for Janet Planet and Sugar Bones respectively. Through two more songs, 'All The Way' and 'Try Your Luck' the costumes remained, selling the image behind the band before Sugar Bones and Janet Planet again left the stage for wardrobe, leaving Clarence McGuffie and Reggie Goodchild to again have a bit of their own fun; rocking the drum kit and keys. It was all of the elements throughout Confidence Man’s set put together that made the show something so memorable. Between the fashion shifts of Janet Planet and Sugar Bones, the fun of the groups dancing and the endless energy of the two back men, Clarence and Reggie, Confidence Man were able to turn a fun dance album into an exciting and slightly bizarre live performance. It also helped to highlight what Confidence Man’s album Confident Music For Confident People may have lacked as a recorded album, but this in turn further articulated how successfully the recording can translate into a live show, which it was seemingly made for. The album displayed the band’s prowess towards fun and not taking the process too seriously, but each of their songs came to life, clearly made to be put on loud and proud. This, alongside their exaggerated performances, over-the-top outfits and dorky, but delightful dance moves, evolves their recorded sound. After diving into the thumping, spoken track, 'Don’t You Know I’m In A Band' and getting the crowd involved for a big dance through their boppy, debut single release 'Boyfriend (Repeat)', the band left for what seemed mere minutes. Yet, Confidence Man finished on a high, closing out the fun on a song for everyone to sing and get behind, 'Out The Window'. It’s hard-hitting beats and melodic, bouncing “I only want a good time/sunshine” hook help describe the emotion behind the crowd while putting a brilliant full stop on their performance. Finally as if to get one last jab in at the crowd after the lights rose on 170 Russell, both Sugar Bones and Janet Planet returned to the stage to send off the crowd with a shower of ‘Confidence Man’ branded condoms; a final confident and defiant act for the show. You can check out Daniel Hanssen's album review of Confident Music for Confident People here.